100% MONEY BACK GUARANTEE; in the unlikely event there’s anything wrong with your ‘Reach it Grab it’, we offer a completely hassle free money back guarantee. LIGHTWEIGHT, rust proof aluminium body is robust and durable making it suitable for all types of work, indoors and out. NON SLIP rubber claws, that ensure your target object never gets damaged when being picked up – in fact, the 4.5” wide jaws are accurate enough to grab a coin from off of the floor. ERGONOMICALLY DESIGNED TRIGGER, the ‘Reach it Grab it’ is designed to provide maximum comfort for the user. 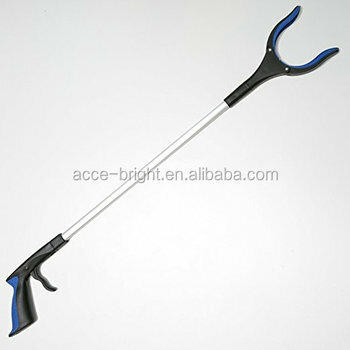 The plastic handle also has a soft rubberised surface making it fit perfectly in your hand and easy to hold. The secret to eliminating hand, arm, back and knee strain..
Finding it a struggle to reach, stretch and bend? If simple tasks are no longer so easy Reach it Grab it is the perfect solution. Its firm and accurate grip allows you to pick almost anything, in fact, it’s so accurate you can even pick up a small coin from the floor! The best multi-purpose reaching aid that gives you the easy way to pick up and clean up! 1. Improves quality of life for people with back pain including spinal injuries, arthritis, knee, hip and joint pain. Reaching aids make life easier, safer and less strenuous for many by reducing the risk of strains and helping them complete tasks that would otherwise be too difficult or painful. 2. Picking up objects lost in tight spaces can be hard even when using a normal reaching aid. The Reach it Grab it features a swivel head, which offers a full 90 degree turning angle, almost anywhere becomes accessible. 3. High grade aluminium construction means that it won’t rust, making it suitable for all outdoor work including removing pond debris and litter picking. 4. Using high quality reaching aids helps people to maintain their independence. It is also designed to be robust and manufactured from the highest quality materials that will last long into the future, each and every Calibre Care product is backed by 100% Money Back Guarantee, so you can buy with confidence.